Pookie, over on Reviews from R’lyeh, has posted a substantial and thorough review of The Cthulhu Hack. The old black cover with Elder Sign stands stark on the page – and I have a few of those lying around. That simplicity now adorns boxes and dice, while the books have moved on to fantastic art from Pete Amachree, Apolonis, Marina Krivenko, and Henning Ludvigsen. 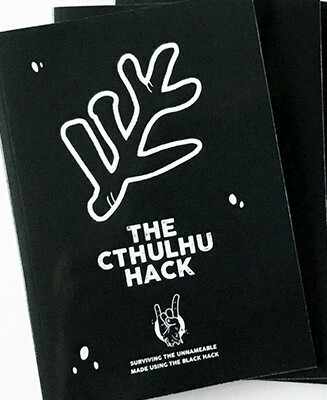 The Cthulhu Hack is … stripped back and it does provide an elegant means for discovering clues and handling investigations in the form of Flashlights and Smokes. … The Cthulhu Hack offers a clean, simple, and unfussy approach to Lovecraftian investigative horror that feels refreshing compared to similar RPGs. For anyone who hasn’t been over to RPGNow recently, The Haunter of the Dark is riding high – no. 3 in the Hottest Small Press and no. 4 in the Top 100 Products (with The Cthulhu Hack at no. 38). The Haunter of the Dark takes HP Lovecraft’s final Mythos tale of doomed writer Robert Blake and guides you, in clear steps, through the process of turning it into an adventure for The Cthulhu Hack.